For other uses, see British Museum (disambiguation). Today, the British Museum has grown to become one of the largest museums in the world, covering an area of over 92,000 m2 (990,000 sq. ft). [not in citation given] In addition to 21,600 m2 (232,000 sq. ft) of on-site storage space, and 9,400 m2 (101,000 sq. ft) of external storage space. Altogether the British Museum showcases on public display less than 1% of its entire collection, approximately 50,000 items. There are nearly one hundred galleries open to the public, representing 2 miles (3.2 km) of exhibition space, although the less popular ones have restricted opening times. However, the lack of a large temporary exhibition space has led to the £135 million World Conservation and Exhibition Centre to provide one and to concentrate all the museum's conservation facilities into one Conservation Centre. This project was announced in July 2007, with the architects Rogers Stirk Harbour and Partners. It was granted planning permission in December 2009 and was completed in time for the Viking exhibition in March 2014. There are groups of drawings by Leonardo da Vinci, Raphael, Michelangelo, (including his only surviving full-scale cartoon), Dürer (a collection of 138 drawings is one of the finest in existence), Peter Paul Rubens, Rembrandt, Claude and Watteau, and largely complete collections of the works of all the great printmakers including Dürer (99 engravings, 6 etchings and most of his 346 woodcuts), Rembrandt and Goya. More than 30,000 British drawings and watercolours include important examples of work by Hogarth, Sandby, Turner, Girtin, Constable, Cotman, Cox, Gillray, Rowlandson and Cruikshank, as well as all the great Victorians. There are about a million British prints including more than 20,000 satires and outstanding collections of works by William Blake and Thomas Bewick.. The great eleven volume Catalogue of Political and Personal Satires Preserved in the Department of Prints and Drawings in the British Museum compiled between 1870 and 1954 is the definitive reference work for the study of British Satirical prints. Over 500,000 objects from the department are now on the online collection database, many with high-quality images. A 2011 donation of £1 million enabled the museum to acquire a complete set of Pablo Picasso's Vollard Suite. In recent years, controversies pertaining to reparation of artefacts taken from the Old Summer Palace in Beijing during the Anglo-French invasion of China in 1860 have also begun to surface. The ransacking and destruction of the Chinese palaces has led to unhealed historical wounds in Chinese culture. Victor Hugo condemned the French and British for their plundering. The British Museum and the Victoria & Albert Museum, among others, have been asked since 2009 to open their archives for investigation by a team of Chinese investigators as a part of an international mission to document lost national treasures. However, there have been fears that the United Kingdom may be asked to return these treasures. As of 2010[update], Neil MacGregor, the Director of the British Museum, said he hoped that both British and Chinese investigators would work together on the controversial collection, which continues to result in resentment in China. 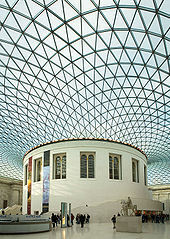 Wikimedia Commons has media related to British Museum. A statue is a free-standing sculpture in which the realistic, full-length figures of persons or animals or non-representational forms are carved in a durable material like wood, metal, or stone. Typical statues are life-sized or close to life-size; a sculpture that represents persons or animals in full figure but that is small enough to lift and carry is a statuette or figurine, while one more than twice life-size is a colossal statue. The Archaeological Museum of Thessaloniki is a museum in Thessaloniki, Central Macedonia, Greece. It holds and interprets artifacts from the Prehistoric, Archaic, Classical, Hellenistic and Roman periods, mostly from the city of Thessaloniki but also from the region of Macedonia in general. The National Archaeological Museum of Naples is an important Italian archaeological museum, particularly for ancient Roman remains. Its collection includes works from Greek, Roman and Renaissance times, and especially Roman artifacts from nearby Pompeii, Stabiae and Herculaneum. It was formerly the Real Museo Borbonico. Ancient Greek sculpture is the sculpture of ancient Greece. Modern scholarship identifies three major stages in monumental sculpture. At all periods there were great numbers of Greek terracotta figurines and small sculptures in metal and other materials. The National Archaeological Museum in Athens houses some of the most important artifacts from a variety of archaeological locations around Greece from prehistory to late antiquity. It is considered one of the greatest museums in the world and contains the richest collection of artifacts from Greek antiquity worldwide. It is situated in the Exarcheia area in central Athens between Epirus Street, Bouboulinas Street and Tositsas Street while its entrance is on the Patission Street adjacent to the historical building of the Athens Polytechnic university. The National Museum in New Delhi, also known as the National Museum of India, is one of the largest museums in India. Established in 1949, it holds variety of articles ranging from pre-historic era to modern works of art. It functions under the Ministry of Culture, Government of India. The museum is situated on the corner of Janpath and Maulana Azad Road. The blue–print of the National Museum had been prepared by the Gwyer Committee set up by the Government of India in 1946. The museum has around 200,000 works of art, both of Indian and foreign origin, covering over 5,000 years. The Department of Asia in the British Museum is one of the largest collections of historical artifacts from Asia, consisting of over 75,000 objects covering the material culture of the Asian continent, and dating from the Neolithic age up to the present. The Staatliche Antikensammlungen is a museum in Munich's Kunstareal holding Bavaria's collections of antiquities from Greece, Etruria and Rome, though the sculpture collection is located in the opposite Glyptothek and works created in Bavaria are on display in a separate museum. Ancient Egypt also has its own museum. The Department of Ancient Egypt and Sudan is a department forming an historic part of the British Museum, housing the world's largest and most comprehensive collection of Egyptian antiquities outside the Egyptian Museum in Cairo. The Department of the Middle East, numbering some 330,000 works, forms a significant part of the collections of the British Museum, and the world's largest collection of Mesopotamian antiquities outside Iraq. The collections represent the civilisations of the ancient Near East and its adjacent areas. Delphi Archaeological museum is one of the principal museums of Greece and one of the most visited. It is operated by the Greek Ministry of Culture. Founded in 1903, it has been rearranged several times and houses the discoveries made at the panhellenic sanctuary of Delphi, which date from the Late Helladic (Mycenean) period to the early Byzantine era. The National Archaeological Museum of Florence is an archaeological museum in Florence, Italy. It is located at 1 piazza Santissima Annunziata, in the Palazzo della Crocetta. The Oriental Museum, formerly the Gulbenkian Museum of Oriental Art and Archaeology, is a museum of the University of Durham in England. The museum has a collection of more than 23,500 Chinese, Egyptian, Korean, Indian, Japanese and other far east and Asian artefacts. The museum was founded due to the need to house an increasing collection of Oriental artefacts used by the School of Oriental Studies, that were previously housed around the University. The Museum's Chinese and Egyptian collections are 'designated' by the Museums, Libraries and Archives Council (MLA) as being of "national and international importance". The Museum of Fine Arts of Lyon is a municipal museum of fine arts in the French city of Lyon. It is housed near place des Terreaux in a former Benedictine convent of the 17th and 18th centuries. It was restored between 1988 and 1998, and despite these important restoration works it remained open to visitors. Its collections range from ancient Egypt antiquities to the Modern art period and make the museum one of the most important in Europe. It hosts important exhibitions of art : recently there have been exhibitions of works by Georges Braque and Henri Laurens, then one on the work of Théodore Géricault. It is one of the largest art museums in France. The National Museum of Ireland – Archaeology is a branch of the National Museum of Ireland located on Kildare Street in Dublin, Ireland, and dealing with Irish and other antiquities. In general, the museum covers the history of Ireland from the Stone Age to the Late Middle Ages. Many important artefacts from the museum were featured in The Irish Times feature and book A History of Ireland in 100 Objects. The Archaeological Museum of Milos is a museum, in Plaka, Milos on Milos, in Greece. Its collections include exhibits dating from the late Neolithic to the Byzantine period. The unique is collection of ancient Cycladic art, especially numerous findings from Phylakopi on Milos, from early Bronze Age to the late Bronze Age. The best pieces from Phylakopi are indeed in Ashmolean Museum (Oford), in the British Museum and in the National Museum of Athens and elsewhere around the world, but also here to Milos remained enough nice things.